Here’s where the theories kick in: some people think that her son Trig is actually 16 year-old Bristol Palin’s baby. The theory is that due to their staunch pro-life beliefs, the Palins hid the pregnancy and have decided to raise little Trig as their own. Omg, highschoolers were talking smack? No way! If the Palins were out to hide something big like this, would they put Bristol in tight clothing out front like that? Hmm I guess that’s where the mono comes in. So okay, okay, conspiracy theories are fun. A lot of this “evidence” isn’t much of evidence, & I agree. But the zaniest part of it all to me in terms of ‘hmm, could it be?’ is Palin’s labor. According to a newsminer.com article back in April, Gov. Palin flew from Dallas to Anchorage while in labor-an 8 hour flight! Her water broke one morning before giving a speech in Texas and she STILL GAVE IT. A keynote luncheon address. At the Republican Governor’s Energy Conference. While in labor. Man, she really is a barracuda, huh? The baby was born 7 hours after landing in Alaska, and Palin told everyone that he was her easiest delivery of them all. On top of this, Alaska Airlines representative Caroline Boren said, “Governor Palin was extremely pleasant to flight attendants and her stage of pregnancy was not apparent by observation as she didn’t show any signs of distress.” Many airlines won’t even allow women that far along to fly, nevermind women who are actively in labor. And also, what doctors okays such a travel at that stage in the game? Yowzas. Really, the coverage of this VP pick just gets weirder and weirder. Here’s another case of public versus private life. 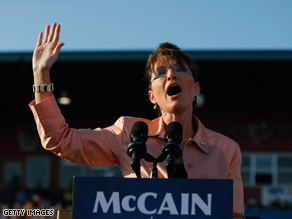 If Palin did indeed cover up her daughter’s pregnancy, then that is her own family’s decision. But now this woman is on the center stage of American politics. Her entire life will continue to be under scrutiny for months, perhaps years to come. (The recent downfall of Democratic Golden Boy John Edwards should serve as a reminder on this one.) Whether these rumors are true or not, Palin has her work more than cut out for her in this race, as does McCain in defending his nominee. An increasingly interesting pick at a time when all energy really needs to be spent on the issues at hand in terms of, oh, let’s see, running the country. John McCain had better hope that going with his gut for this pick was truly worth what the media is about to put Gov. Palin and her family through. For her family’s sake, I hope decision is something she really thought through before accepting this nomination as it will truly be life-changing, win or lose. Let’s not let our politics distract us from what our fellow Americans in Louisiana are facing: The mayor of New Orleans has issued a mandatory evacuation for all citizens. He told them that they “need to be scared” and to get their “butts moving”. Mayor Ray Nagin told citizens that if they stay, there will be no emergency services available to help them and that this storm may be worse than Katrina. “This is the mother of all storms, and I’m not sure we’ve seen anything like it. This is the real deal. This is not a test. For everyone thinking they can ride this storm out, I have news for you: that will be one of the biggest mistakes you can make in your life,” he said. The storm has already hit Cuba and is a category 4 still gaining momentum as it prepares to enter the Gulf of Mexico. Katrina, a category 5 storm , hit New Orleans just 3 years ago in 2005. According to emerging reports, Gov. Palin was just booed on only her second stop on the campaign trail when she mentioned Sen. Hillary Clinton. Just like her speech yesterday in Ohio, she attempted to give a nod to Geraldine Ferraro and to Hillary Clinton for showing “determination and grace in her presidential campaign.” Since it just happened, it’s so far unclear as to whether these folks were booing because they disliked her mention or if they were boos of of resentment directed at Sen. Clinton. Either way, doesn’t seem like the “disillusioned Hillary supporters” were feelin’ it. Ohhh YouTube. Sometimes you can’t get videos fast enough. UPDATE: Here’s the video. Not so sure this one was worth the hype, kids. 1. He has a stuffed dancing hamster on display in his Senate office. 10. He talks to fellow prisoners of war, those with whom he shared a cell in Vietnam, almost daily. 12. His wife was in Bangladesh on a charity mission and brought home baby Bridget without checking first with McCain. 21. He doesn’t e-mail. He doesn’t surf the Web. He likes to read the newspaper in print. He’s attached to his cell phone. 3. His mother’s name was Stanley Ann Dunham — her father, Stanley, wanted a boy. 9. While a student at Harvard Law School, he applied to appear in a black pride pinup calendar. He was rejected by an all-female committee. 19. He carries good luck charms, including a gambler’s lucky chit, a tiny Madonna and child, and a bracelet belonging to a soldier deployed in Iraq. 24. He has promised his daughters, Malia, 10, and Sasha, 7, a dog this fall — win or lose. I’m glad to see that environmental issues are getting some primetime play this election.. (About time!) Former VP Al Gore gave a great speech on this topic at the DNC (although his delivery could have been slightly less rushed), and more Americans than ever before seem to be taking note. Both candidates are facing pressure to go green and find ways to eliminate our nation’s dependence on foreign oil. Kids, if we don’t have our Earth, we don’t have America. We need to step up and do right by our planet. With this in mind, the candidate’s energy plans are incredibly important. Taking a look at both plans, there are many of the same ideas. A lot of Democrats like to make it like John McCain has no interest in alternative energy, but that’s not true. Like Obama, McCain also believes in giving rebates to Americans and an economy-wide cap-and-trade program. Given all that I had heard in the media and all of the talk of ‘more of the same,’ I was pleasantly surprised to find such mentions on McCain’s website. Sen. McCain mentions Climate Change and Greenhouse gases, but he doesn’t discuss details or why this topic is so important. Sen. Obama says that 5 million green jobs will be created. Sen. McCain gives no range or numbers. Sen. McCain says that he’ll invest in electric cars while Sen. Obama says that we’ll put 1 million plug-in hybrid cars on the road by 2015. In general, a main distinction to me is McCain’s lack of specifics, and people like specifics. While his plan features some the same ideas that Obama’s does, his first solution to getting America off our foreign oil independence is to drill here. A lot. His VP pick, Gov. Sarah Palin, has fought to drill in Alaska, even petitioning to get polar bears off the endangered species list in an effort to find ways to drill more. Another reason I’m quite fond of Obama’s plan is because he stresses communication with other nations to get the whole world going green. His plan includes working with the UN to get other countries working toward the same goals of addressing the climate problem and working together to find solutions. The US needs to serve as an example, instead of ignoring environmental treaties as the Bush Administration has been fond of. That said, I was very pleased to see that not only does Obama want us to get in gear, he wants us to become a world leader in the development of green techonologies. So, please peruse the candidate’s respective plans and find out more information. Don’t take what the media says to be the only truth out there. There’s no excuse for being oblivious in an age when information is abound. Some people say this is the best moment of the Daily Show’s campaign season. Others say it’s disgraceful. See for yourself.